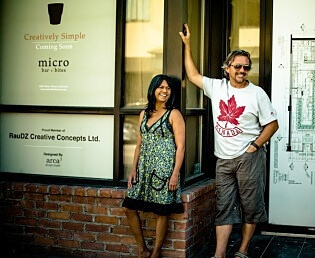 Co-owners Audrey Surrao and Chef Rod Butters (voted Best Chef by the readers of Okanagan Life) are thrilled to announce the long awaited opening of micro bar • bites in downtown Kelowna on Saturday, November 2nd at 3:00 pm. With their freshly issued license in hand, Micro will open this Saturday with a creatively simple approach to the bar and food menu with a selection of mixed drinks, International and local wines and beers along with a selection of ‘bites’. Manager Amy Laird, Chef Evelynn Takoff and the staff of micro look forward to welcoming everyone to downtown Kelowna’s newest hot spot. The entire team at RauDZ Regional Concepts Ltd. wish to thank everyone for their support and patience through the liquor licensing process. Micro is located at 1500 Water Street, Kelowna, just steps away from the owner’s successful restaurant RauDZ Regional Table. Micro will be open daily from 3:00 pm until close. Unlike RauDZ, micro is a bar so no minors are permitted and everyone must be 19+ with appropriate identification.